Only two works were on the program for the Eastern Music Festival's final concert of the student orchestras, both of them masterpieces of the early 20th century. This concert was the culmination of six weeks spent learning new music, perfecting new techniques, and making new friends. 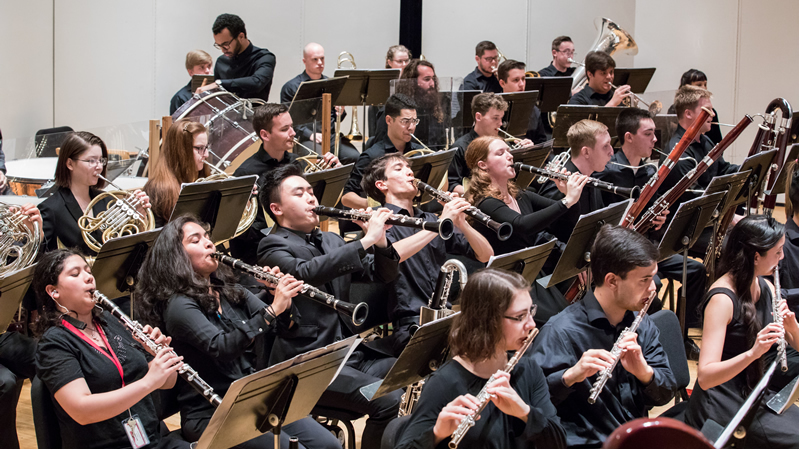 Each orchestra, some 70-80 musicians strong, has its own conductor and its own weekly concert with guest soloists and a different concertmaster chosen by the faculty from the violin section of the respective orchestra. The orchestras remain fixed each week, but from one week to the next, both musicians and conductors move from one orchestra to the other depending on the exigencies of the scoring, which changes from composer to composer and from piece to piece. The first composition of the final evening was Claude Debussy's La mer (The Sea), a symphonic work in three movements for large orchestra composed in 1903. Choosing a poetic phrase to describe each movement rather than a technical term for a tempo or a mood, Debussy pays allegiance to his dedication to French literary movements such as Symbolism. Thus the first movement is entitled "La mer de l'aube à midi" (The sea from dawn to noon) and begins from the most quiet, glassy stillness, awakening through musical swirls of color and swells of sound. The students, under the direction of Maestro Grant Cooper, played very well although sometimes the brisk tempos seemed a bit forced, especially the passage with the divided cello and horns. The second movement, "Jeux des vagues" (Games of waves), endured speedy tempos better than the languorous first, being a sort of scherzo. It ended quietly in a freeze-frame pose for all on stage, a hallmark of Maestro Cooper's closing pianissimo. The final movement, "Dialogue du vent et de la mer" (Dialogue of the wind and the sea) begins ominously and menacingly and ends each early phrase with a portentous gong. And indeed, a tremendous musical storm ensues, utilizing the full resources of the musicians, interrupted twice by heraldic trumpet solos – once muted, once un-muted – admirably played by Chris Chervet (19, from Pleasanton, California). Perhaps the most sublime moment of the entire work follows in an eerie calm – like the eye of a hurricane – when the oboe and flute, joined by the clarinet (and later English horn and piccolo) play the principal theme of the movement, pianissimo, over high harmonics in the violins and tremolos in the lower strings! This was breathtakingly beautiful! Bravo to all the young musicians on stage! After a lengthy intermission and much work by the student stage crew adding chairs and stands for an even larger orchestra (I counted 84 players), the musicians attacked the treacherously difficult score of the Suite from the Miraculous Mandarin, a ballet-pantomime composed by Belà Bartók at the end of World War I. Set in a busy metropolis, it is a story of greed, lust, and seduction that makes ample use of dissonance and raw musical force – brass, percussion, and shrill woodwinds. For the most part, these were well balanced. But there was a moment at the start of the "chase scene" that closes the Suite where the off-beat percussion was so loud that it drowned out the fugal entrances that typify a chase. However, there were tender moments as well, several quasi-waltzes and some seductive, alluring clarinet solos, expertly played by Ivan Ferguson (18, Las Vegas, Nevada) and Johnny Wang (19, Pleasanton, California). In addition to virtuoso clarinets, Bartók makes great demands on the trombones Robby Meese (20, Myrtle Beach, South Carolina), Nick Losos (19, Aledo, Texas), and Ian Calhoun (20, Red Wing, Minnesota), who produced terrific results, muted and un-muted, with some astounding glissandi! The other group that must be singled out for awesome playing is the viola section, led by Olive Loentz (16, Oak Park, Illinois). The whole ensemble was masterfully conducted by the baton-less (still!) maestro, José-Luis Novo.